If you’ve followed Foolish IT in the past few years, you may remember dMaintenance, which got some attention on some popular tech sites at the time. 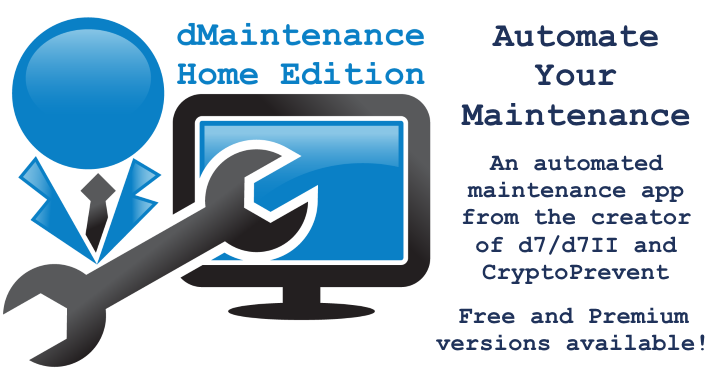 What was dMaintenance was later revamped in dSupportSuite and even the popular technician’s repair multi-tool d7II, which contain newer updated versions of the old dMaintenance code with bug fixes and tons of new functionality. Until now, there was no option for home users to benefit from the same automated and thorough maintenance that PC repair technicians have enjoyed for years. Run a full maintenance routine with one click. Professional maintenance routines designed by a PC repair technician. Run automated virus/malware scans as part of your maintenance routine. View results in a neatly formatted log file. Schedule maintenance routines to run automatically and/or silently. Automatic updates to the software. Email log file when completed. Click to visit the dMaintenance Home Edition home page.